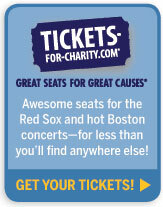 A Boston Food Diary: Tickets For Charity- the place to purchase your Sox tickets this season! Tickets For Charity- the place to purchase your Sox tickets this season! It's Friday, and beyond that it's Opening Day down at Fenway! So while strains of "Play Ball" and "Take Me Out to the Ball Game" can be heard all over this city, I thought I'd take a quick deviation from my normal schedule of food, food, and um, more food to alert you all to a pretty incredible organization that I hope to be working with more in the coming months. Tickets for Charity is a Boston based organization that raises money for various organizations by bringing you the tickets to the games and concerts that you want to see. Given what to day is, I'll start with the Red Sox. Tickets for Charity works directly with the Sox to secure tickets for every game. They then monitor the prices for similar tickets listed on Ace Tickets and those other popular ticketing agents, and make sure that their prices come in at the same price, or lower where possible. The beauty of Tickets for Charity is that when you buy from them they donate 100% of the profits, less any standard processing fees, directly to the Red Sox Foundation. The RSF then uses the money to support our community by donating to the Jimmy Fund, Dimock Community Health Centers, the Red Sox Scholars organization as well as multiple youth baseball leagues. More information can be found here. Tickets for Charity doesn't just work with the Sox though (for those of you who aren't completely obsessed), they also offer tickets to a variety of concerts and theatre events. Donations from those sales are routed to the artists charity of choice. So what sounds better, buying tickets from a "regular" agency, with the profits all going into the pockets of a shrewd business man (I'm sure they are lovely- no hard feelings) or to the deserving hands charities around the country? 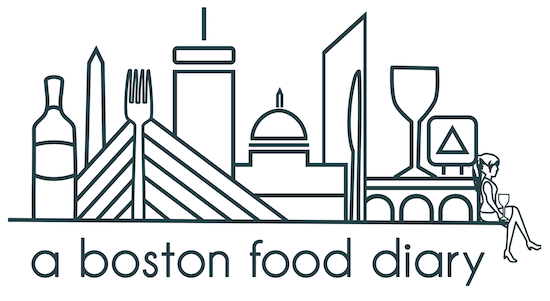 As this season progresses, please look to Tickets for Charity for all the games that you want to see- and to make it easier- I'm installing a button right on the side bar of A Boston Food Diary direct to Tickets for Charity. Please help me to support this great organization.